It’s unusual aircraft day at FlightSimN, with a look at two distinctively intriguing FSX/P3D add-ons – the PA36 Pawnee Brave 375 crop duster from the crew at Alabeo that lets you spray crops with pesticide until the cows come home (agricultural metaphors, yes), and Aerosoft’s twin-nacelle, light attack OV-10 Bronco that was a mainstay of the Vietnam war during the 70s. First, forget your Woodcutter Simulation 2013s, crop dusting is where the cool kids are. No, really. (Not really.) Yes, just when you thought agriculture-related gaming awesome couldn’t get any more agricultural or awesomer, word comes in Alabeo brings you stunningly high-def 2048×2048 aircraft textures and the appealing sounding ‘Chemical Fumigation Liquid Effect’ (bug killer to you and me) that actually affects the weight performance of your aircraft as you drop it over the fields. Speaking of fields, the Pawnee package provides access to a free scenery update for the highly agricultural area of Bloomington, Illinois (including its airport at Cottonwood) for you to cover in the lethal mist. You also get a mission pack tasking you with – wait for it – spraying a field presumably while avoiding covering the nearby baby milk factory with lethal fungicide. You’ll be given pointers in the fine art of effective spray coverage patterns, so even if you’ve never dusted crops in real life (and really, what have you been doing with your life?) you’ll soon pick up the basics and be an expert aerial applier before you know it. The actual PA36 itself comes with five liveries, a blank one for you to create your own corporate crop spraying logo, flight dynamics that reflect the agile nature of these single-prop workhorses, and all the authentic sound effects you could ask for minus the ungodly screams of unfortunately-placed farmers having their eyes burnt out as you fly overhead and let rip. Enjoy. 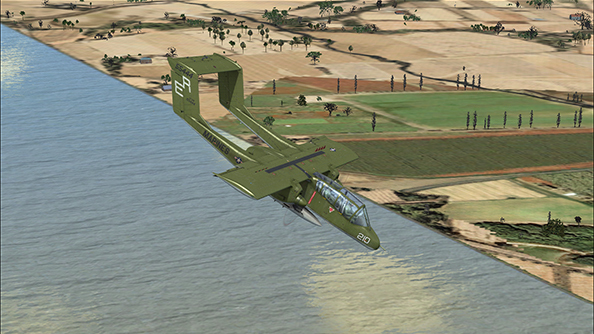 Meanwhile, the OV-10 Bronco is one of those bizarre, almost sci-fi-looking birds that occasionally come along. 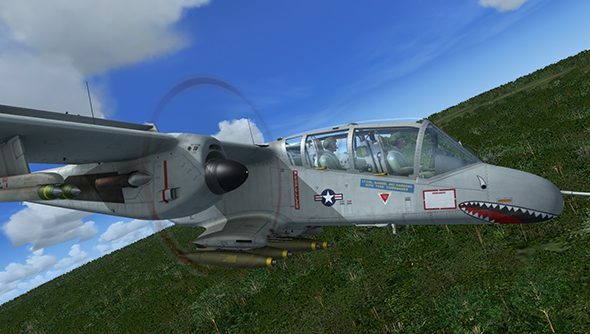 Designed to undertake all manner of counter-insurgency roles during Vietnam, the Bronco is an agile aircraft that is more at home hugging treetops than skimming through clouds. Technically it’s a stand-up model, with all the standard animations in place and a gorgeous 3D cockpit that nails the metallic nature of 60s/70s engineering. There are plenty of loadouts (including bombs, fuel tanks and rocket pods) and little touches such as instrument needles that vibrate on uneven surfaces and an interactive electrical system should you want to experiment. All in all, a curious couple of aircraft that both involve plenty of challenging low-level operations. You’ll have to make your own missions with the Bronco of course, as there are no including activities with that pack, just the aircraft, but imagining doing ground-attack runs of enemy troops definitely makes an atmospheric change from pretending you’re ferrying sightseers about the place. You’re reading theflight simchannel at PCGamesN. We combine new, original content with feeds from the best flight sim websites and reader submissions. For the best, new stuff about all flight sims, check ourhomepageandfollow ourflight simTwitter accountfor regular updates. Check our retail partner SimStop forFlight Simulator add onsand more.